Moving from something completely custom in the Avalon to something we’ve seen before, but upgraded. 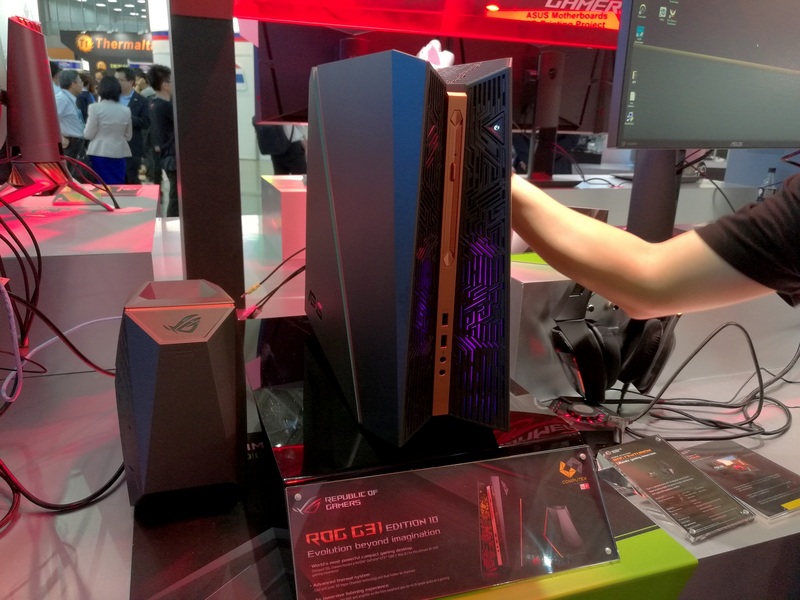 The new G31 Edition 10 is an upgraded version of the G20, a gaming desktop PC that ASUS announced last year under their Mayan-style design strategy that also included the small book-sized GR8 desktop. The G20 aimed at the crowd that wanted a different style of desktop/gaming machine, with a different look but everything pretty much integrated in a design that aimed to adjust the airflow for such a large amount of power. The G31 by comparison doubles up the number of GPUs and equips the system with the latest processors and memory. 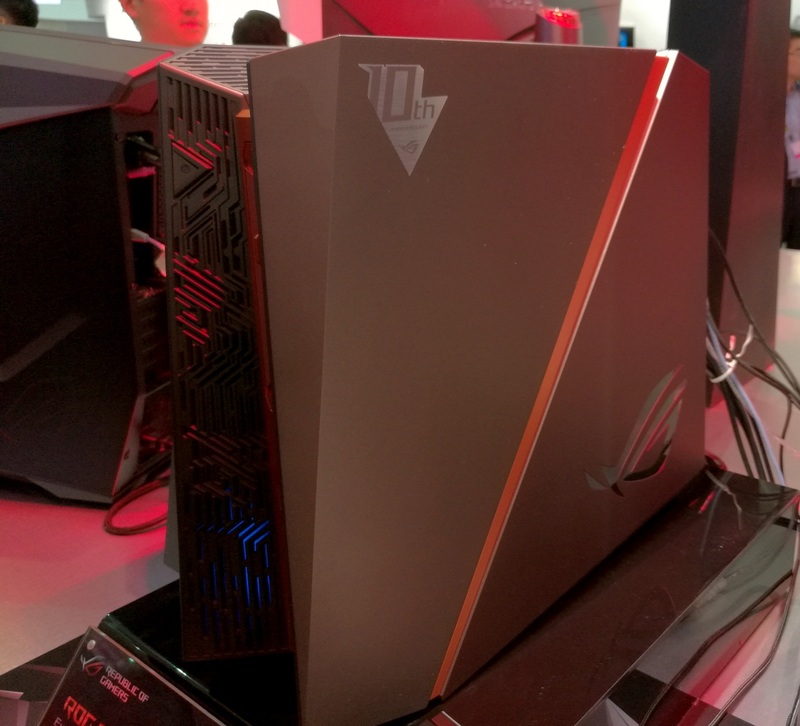 The Edition 10 version of the G31, designed for the ROG 10-Year, will be the fully upgraded model with a 10-Year sticker on the side. This edition will house a full Core i7 (most likely the i7-6700/K), two full GTX 1080s in SLI, the Z170 chipset, support for four DDR4 memory modules and 64 GB (it’s not mentioned if they are SO-DIMM or regular), and at least two M.2 PCIe 3.0 x4 slots capable of RAID-0. To top it off, the optical disk drive at the front is also a Blu-Ray writer/DVD writer as well. For the Edition 10, all the LEDs are RGB and additional LEDs are placed down the side stripe as well. Being under the red lights on the show made it a bit difficult to see the LEDs, but the full chassis comes in at a 20L volume. If we compare that to the recent review of the NZKT Manta mini-ITX case from Tracy which comes in at 47L, we can see the benefits of going custom in something like this – the full motherboard and GPUs are custom for the design and are arranged to use the cooling system as efficient as possible. 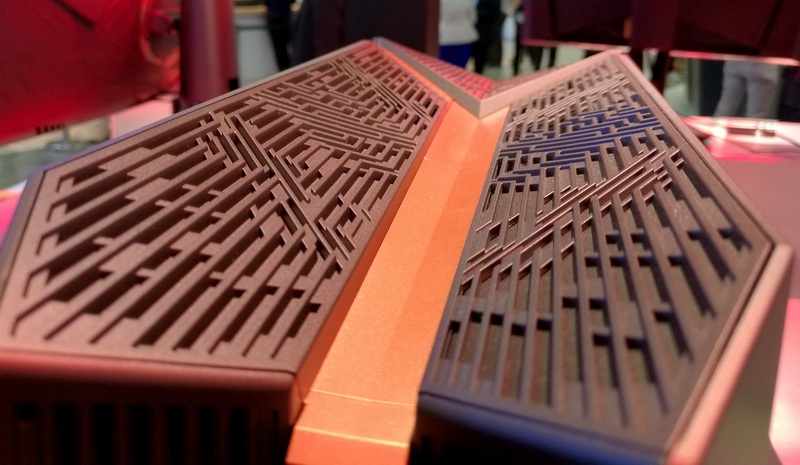 Typically a PC chassis has the power supply bundled inside, however to fit this shape and design ASUS are going with an external power supply. We weren’t given an exact rating, but if we give a generous budget of 100W for the CPU, 200W each for the GPUs, 100W for everything else and then an extra 20%, then it’s probably around 720W. No words as to pricing or release dates as of yet, but the high end ROG G20 with an i7-4790, 16GB of DRAM, a single GTX 745 and a 1TB SSD is currently retailing on Amazon for $1360. I would expect the high edition ROG G31, with dual GTX 1080 GPUs and 64GB of memory, to be nearer $4000. 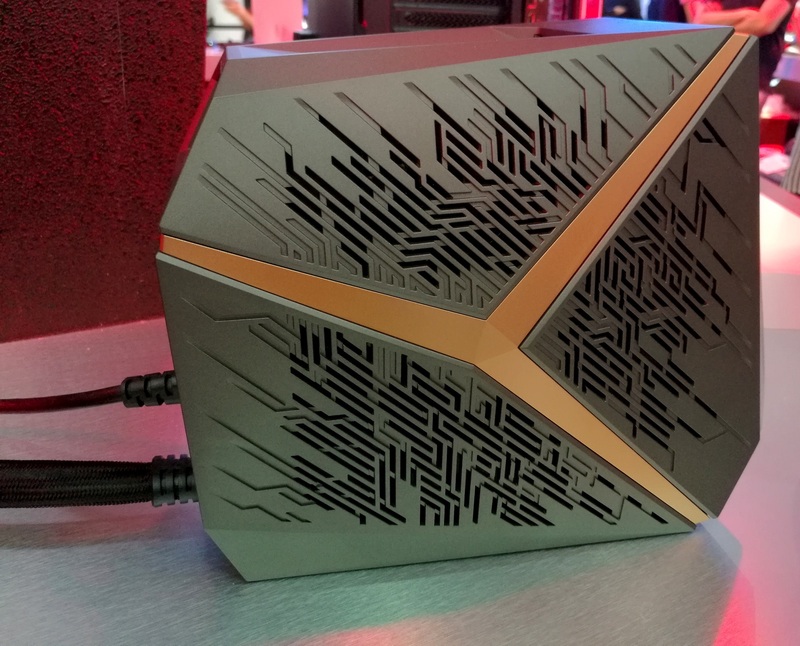 Of course, something like the MSI Vortex (which uses mobile GPU variants of GTX 960/970) is the competition here, and the high end version of that is $4000 as well. Project Avalon has my attention. Please Asus, make it work and let it be adopted by other players. I know R&D cost and you want your work to be rewarded, but please think of the Children! Why no one thinks of the Children?! "currently ways almost 40 lbs"